The San Diego Chargers on Thursday rejected a developer's proposal to build a $1 billion stadium as part of a redevelopment of the land surrounding Qualcomm Stadium, saying the project would be too enormous for the Mission Valley site. Hours before Perry Dealy publicly unveiled the project, attorney Mark Fabiani sent the developer a letter saying the team doesn't think it has a realistic chance and asking him to stop referring to the Chargers in promoting the project. "We did it reluctantly," Fabiani told The Associated Press. Southern California's only NFL team has said since 2002 that it needs a new stadium to remain financially competitive with other franchises. 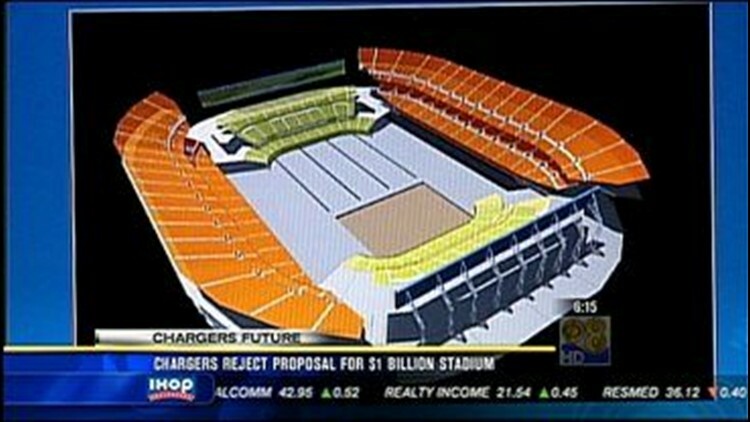 Three years ago the Chargers gave up on their own plans for a stadium at the Qualcomm site, but Dealy crafted a new proposal anyway, despite Fabiani's warning to him in January that the team spent several years and millions of dollars trying to make a project there work, said Fabiani, the team's lead negotiator on the stadium issue. Dealy's proposal, called The River Park at Mission Valley, would include a 70,000-seat stadium, 3.76 million square feet of office space in 11 buildings, a 16-story hotel, nearly 6,000 residential units, 500,000 square feet of retail space and 14,000 parking spaces. Fabiani called Dealy's project "fantastical," with "mythical skyscrapers, mythical prices and a mythical stadium." "It was not, in our view, a productive situation, for the simple reason that the project is as predicted, so dense that it's never going to be built," Fabiani said. "We're a lot closer to the end of the process than we are the beginning, and for those people who care about finding a solution, we shouldn't be spending time on stuff that has zero chance of actually happening." The Chargers would like to build a stadium on San Diego Bay in suburban Chula Vista, but the project is stalled due to uncertainty over the shutdown date for a power plant on the site. Fabiani said other sites around San Diego County have emerged as possibilities, including east of Petco Park, the downtown home of baseball's Padres. Dealy said he and his group are looking for a better use for the 166-acre Qualcomm site, where the stadium sits in the middle of a vast parking lot. He said he was disappointed with the Chargers' response, and acknowledged that the project has many issues that need to be resolved. "But I would hope that if the Chargers don't have any other options, and this gets some traction, that the Chargers would embrace this as a viable alternative," he said. "We certainly don't want them to leave the region. The worst thing that could happen is if the Chargers say, 'I've got no options in San Diego County, and we're out of here.' And that could happen. That was part of our motivation to be aggressive now." Under Dealy's plan, the Chargers and the NFL would each contribute $200 million to the stadium, while San Diego State would contribute $100 million. The rest would be paid for by land sales and taxes on the surrounding development. Fabiani said the announcement of Dealy's project put the Chargers in the awkward situation of explaining how they could turn it down when few other options have surfaced. "That's part of why this effort by Mr. Dealy is so damaging to us," Fabiani said. "It causes people to ask that question. We don't deserve that after spending seven years and $10 million in this process. We've done everything we can to stay here. If someone with their own ulterior motives comes up with a half-baked plan, you can't blame us for that."